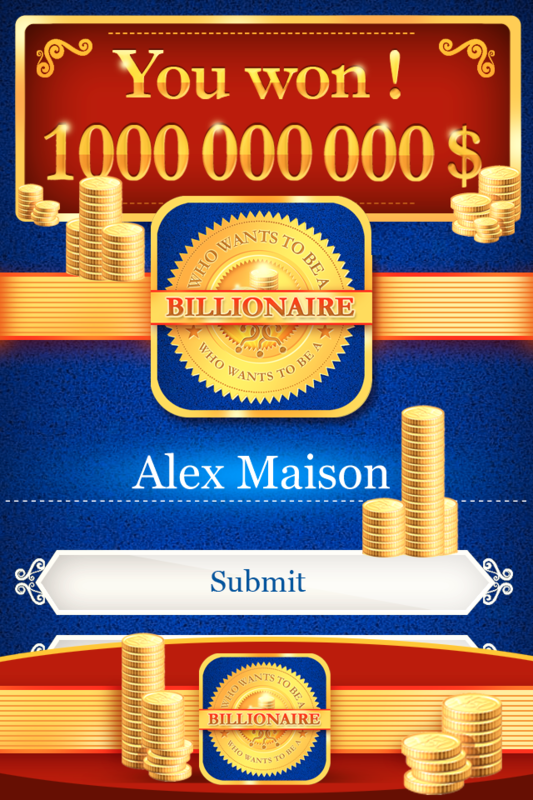 ■□■ Right on your device, play the most daring intellectual game “Who Wants to Be a Golden Billionaire”! 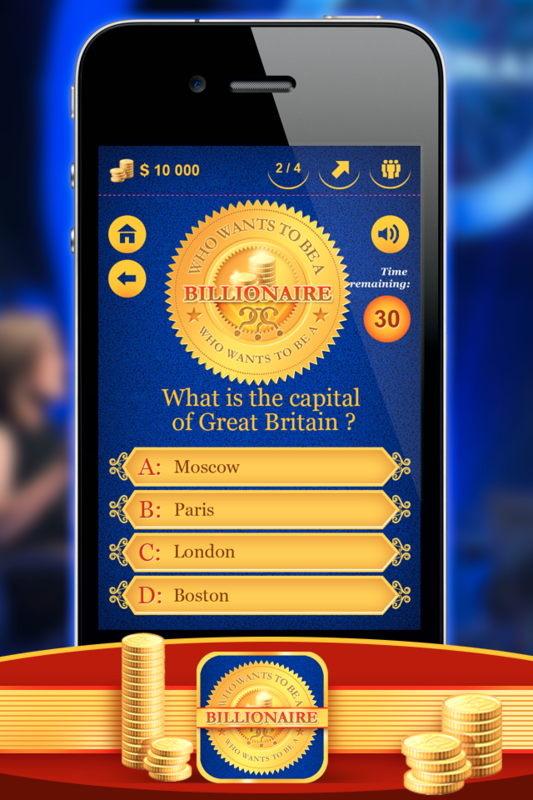 □■□ Mobile version of this exciting quiz will allow you to assess your knowledge and find out whether you have a chance to win a billion! ► Do not miss the opportunity to show off your erudition! 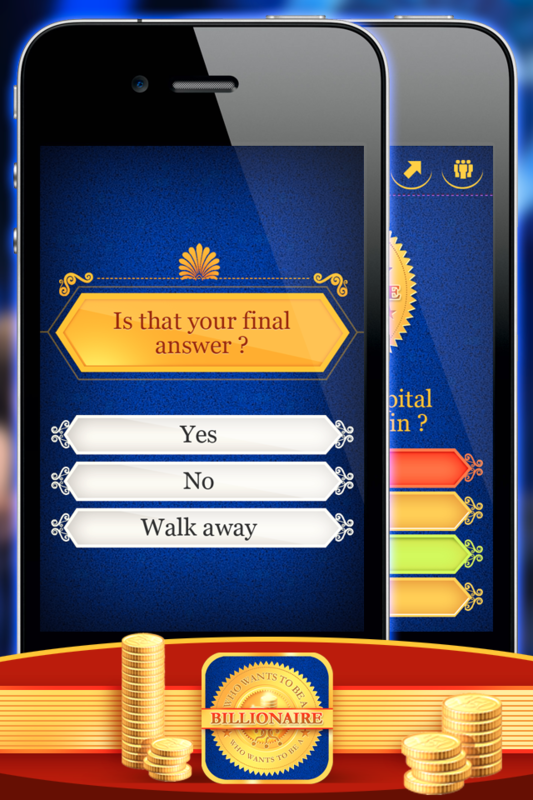 >>> The game will offer you absolutely new and interesting questions on different topics. The closer to the finale, the more difficult questions will stand between you and your virtual billion, and the more you will enjoy the game, finding the right answers in your memory, or using logical thinking. □ Continuous music and live graphics will involve you into the tense atmosphere of risk, excitement and pleasure, where you will have no possibility to be mistaken. □ Use the game as an enjoyable and exciting tool for the development of your intuition. ♦ 15 questions on the way to your billion. ♦ 2 amounts of money that you will not loose. ♦ 3 hints: 2/4, walkers opinion and question replacement. □■□ The game can be played alone or with the friends. In the second case, the game could turn into a funny, noisy event, with the disputes between the members of the group and voting for correct answers. The joint intelligence training will become for you one of the most enjoyable and useful ways to spend the time. >>> Go ahead, answer the questions and win you virtual money, in order to see how much your knowledge, intuition and ability to think cost.